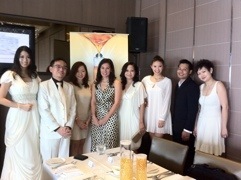 Attended the Pantene Beauty Round Table this morning over a nice luncheon at Stellar@1-Altitude to talk about hair care & how to improve our hair texture. 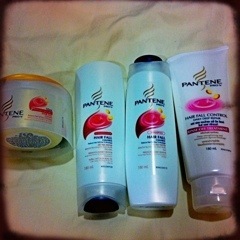 I took up the Pantene 14-Day Challenge and started using the Hairfall Range. Yes, the word “Hairfall” is such a sensitive word to us girls! But I have to admit that ever since I entered the entertainment industry on top of my frequent scuba diving, I realized how much more hair I have been dropping. 😦 initially I thought it was hair loss but then I realized it’s due to hair breakage from really dry and damaged hair. After talking to Dr Jasmine Karsono, I learnt so many useful things about hair. Styling, blow-drying, back-combing are all well known factors to damaged hair. But Dr Karsono told me that salt water is even worse! As salt dehydrates the hair a lot more on top of the prolonged UV exposure which makes hair so much more brittle and prone to breakage. No wonder I get so depressed looking at the amount of hair I drop washing my hair after scuba diving! And the many days after. So…. I used the Hairfall range and I’m still using it as I really love the effects that it has on my hair texture. I used to wake up with really tangled and unruly hair spending quite some time brushing my hair. But after the 7th day of using Pantene’s Hairfall range, I found brushing my hair in the mornings so much easier and less hair is found on my brush. 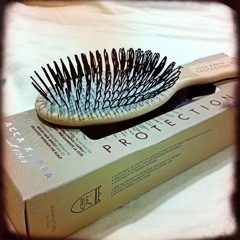 On top of that I too changed to a new Protection brush by Acca Kappa which helped with the brushing through my tangles. My hair now is a lot more shiny especially on the crown of my head and texture is slowly improving. I can’t wait for my hair to feel baby soft again!